In case you missed it, this post is the second installment in a series called “SBG Hacks”. The purpose of this series is to share with you some of the small things I do in my classroom to make my standards-based grading system run smoothly. The first post was about my “Choose Your Own Adventure” quizzes. Today’s post is a big one: my automated reassessment system. Before I jump into how I currently run my reassessments, let me give you some insight into what created a need for this system in the first place. When I first started my SBG journey, I was a first year teacher and an organized reassessment system was not at the top of my priority list. My “system” was students would line up at my desk and I would write them a question off the top of my head on a post-it note. My desk roughly looked like this by the end of the day (figure 1). Obviously this system was not ideal and I needed to make some changes. Luckily that summer I was introduced to the Google Sheets add-on, Autocrat. If you read Ben Meacham’s post on how he simplifies his retake process, my solution takes it one step further.2 Buckle in, this post gets pretty technical. Like Ben’s approach, it starts with a Google Form. 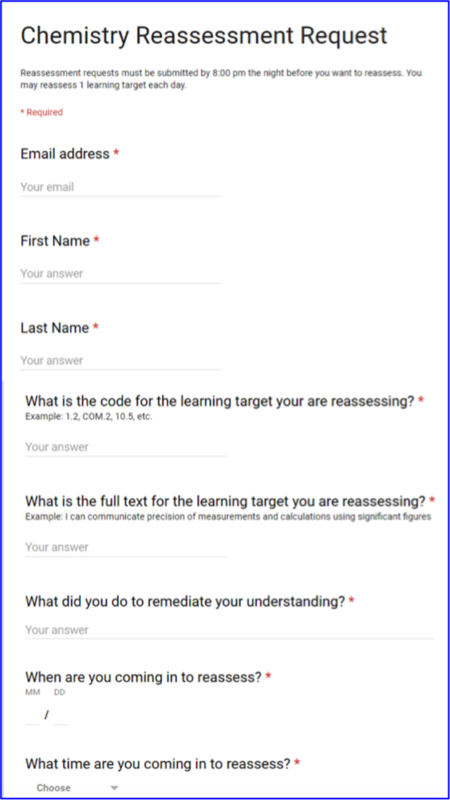 I try to keep my Google Form as simple as possible to make it accessible for students (see figure 2). My ninth grade physical science form is slightly more complex because I teach the co-taught sections so I have a large number of students with IEPs and 504s. Most of my students with IEPs have a small group instruction period with an intervention specialist where they can take their reassessment so I give them a spot on the form to indicate that. The only difference in the forms is the question “do you have a small group instruction period?” which will send students to a different page on the form depending on their answer. If “yes”, the student is directed to input their SGI information, if “no”, the student specifies when they are coming in to reassess. I share this information only to show that Google Forms can be very versatile depending on your needs. 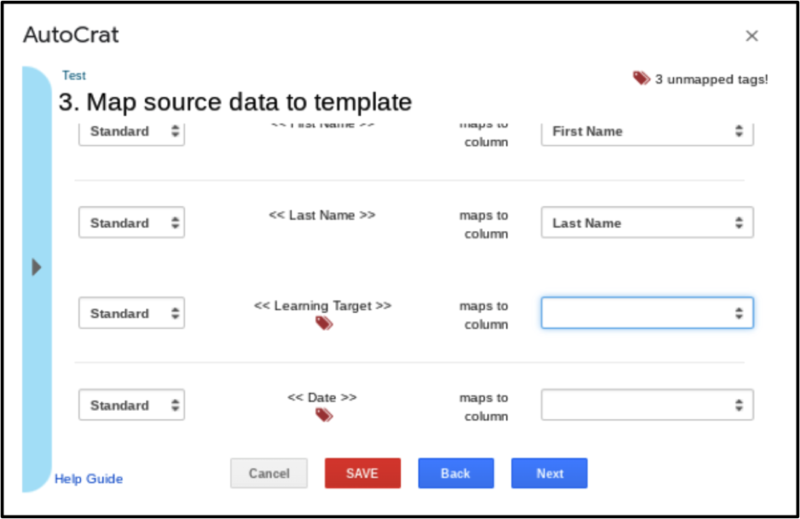 Once you have your form, you need to make a Google Docs template that matches the information entered on your form. Let me introduce you to merge tags. Every time you want Autocrat to fill in information submitted in the Google Form, just put merge tags (<<>>) around the info. See (figure 3) for an example. Anything with a merge tag around it will be filled in by Autocrat from the information the student submits on the form. Anything not in a merge tag will remain the same on every reassessment generated. My template generates the top half of my reassessment page. I put the reassessment question below the dotted line. You can have as much or as little information at the top of your reassessment page as you like. I keep it to the student’s name, the target they are reassessing and when they are coming in to reassess. I have the “got it”, “almost”, “not yet” off to the side because it makes grading easier if I can just quickly circle the grade a student earns. Okay, you have mastered Google Forms and Google Docs, now off to Google Sheets! Open up the Google Sheet associated with your Google Form by viewing the responses to your sheet and clicking the spreadsheet icon (see figure 4). Figure 4: Open the Google Sheet by viewing the responses and clicking the spreadsheet icon. 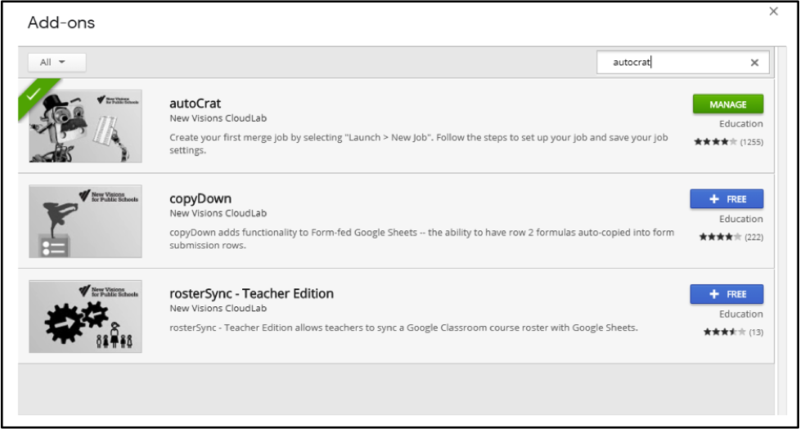 Next, go to the “Add Ons” drop down menu and select “Get Add Ons.” Search for “Autocrat” and add it to Google Sheets (see figure 5). Now when you go to the “Add Ons” drop down menu, Autocrat should be an option. Go ahead and open it. Create a new job and give it a name. The next step is to find the template you made and attach it. The most important step is to match your merge tags with the question from your form that provides the information (columns in your Google Sheet). See figure 6. When you click "Next", it will ask you to make a file naming convention. NOTE: your merge tags here need to match your column headers in your spreadsheet EXACTLY (not the same merge tags from your template). To keep it simple, I make my naming convention <>:<>. The second most important step is to designate a folder for all your generated reassessments to live. You will never visit this folder but it keeps your Google Drive from getting inundated with new Docs. I always create a new folder just for reassessments for a specific prep or class. The next step is optional. I have Autocrat email my students a receipt that also serves as a hall pass if they are leaving study hall. See figure 7 to see what my screen looks like. Note that you need to use the exact column headings in your merge tags here again. Make sure you do not share the Google Doc with students because they will be able to see the reassessment when you type it in. This is why I share the PDF because it only has the header filled in. 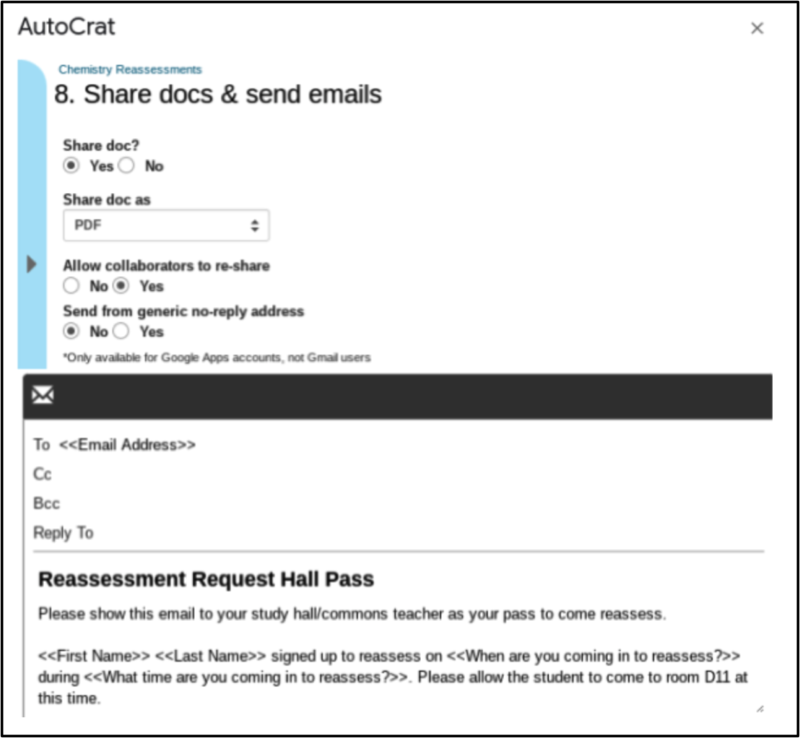 If you do not want Autocrat to email students, just skip this step. For step 9, I always have my job run on a trigger. This means that when a new form is submitted, it will automatically generate the reassessment. If you do not have a trigger, you will have to open Autocrat and manually run it every time you go to make reassessments. Hit “SAVE” and your reassessment bot is done! Let’s try it out! Go to your Google Form and fill it out like you are a student. Now go to your spreadsheet. If you set your form to run on a trigger, give it a second and your should see Autocrat add some columns to your spreadsheet. I hide all of the Autocrat columns except “link to merged doc” to reduce spreadsheet clutter. If Autocrat is not running, open it from your “Add Ons” menu and click the “play” button to run it manually. Click into your newly made merge document by using the link Autocrat generates. If everything went according to plan, your template should be filled in with the information you typed into the form. Now that you have the technical stuff set up, let’s talk workflow. Every morning, I come in and open my reassessment spreadsheets (I have one for every prep I teach). I open all of my new reassessments (I highlight completed ones in green to keep track) and organize them by target. I then insert a question below the dotted line in each of the new reassessments. 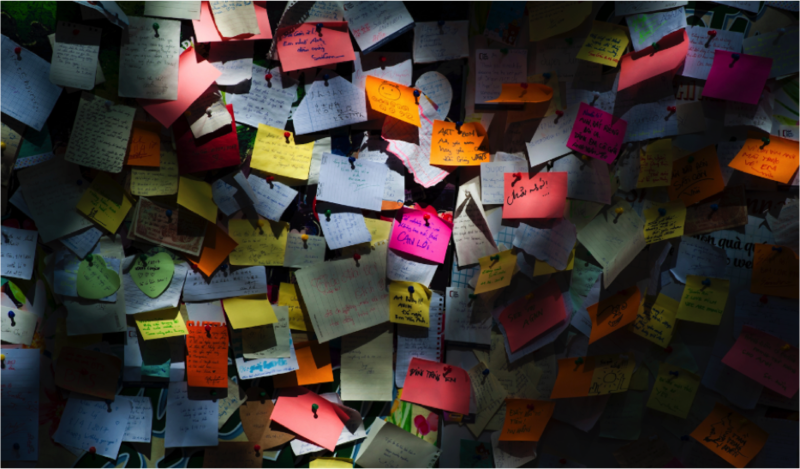 If I was a more organized person, I would have a question bank to do this from. I am not that organized so I just come up with questions off the top of my head or copy/paste from an old worksheet or a quiz from a previous year. 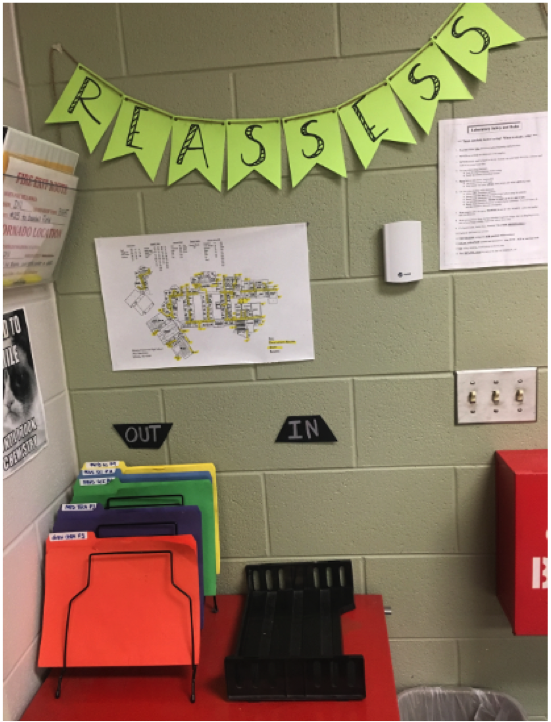 I then print all of the new reassessments and bring them to my reassessment station by the door to my classroom (see figure 8). Each class has a folder. Students come in throughout the day or before or after school, find their reassessment, complete it, turn it in and leave. Students understand that reassessing is a privilege and if they become a distraction to the class in my room at the time, they will lose that privilege. Students take it seriously because they care about their grade and they know a reassessment can drop their grade just as easily as it can raise it. It takes me 10-15 minutes to make reassessments at the beginning of the day and 10-15 minutes to grade them at the end of the day, depending on how many are submitted. This school year I have made 865 reassessments. Next up in SBG Hacks: Homework! Lauren - Love your idea! I plan on trying this next year. I have also used autocrat. I have students fill out the form. They then get in their email a PDF of the standard they need to go over, a template for notes and links to resources. They fill out the notes and come in to do the retake. I have to see that they did some work before I'll let them do a retake. So far, kids have responded really well. Thanks again for your idea.